“We will be charging different prices based on ethnicity, in much the same way as the University weights its admission requirements and scholarship opportunities,” he said. There is no word on what the exact prices of each item for the different races will be, however, VP Kilcullen relayed Asian Americans will be charged the most, followed by Caucasians, followed by Hispanic/Latinos, followed by African-Americans. They are also considering charging more for males. “I don’t think this is the right way going about this. This is just going to continue the discrimination that is still heavily prevalent on this campus,” wrote Gabby Alana Maloney. “Will you guys give free cookies to rich white kids whose parents got them admission, or are you gonna say only minority kids are ‘undeserving? '” wrote Hetal Bhatt. The event has also received criticism from UIUC alumni as well as students from other schools. The Tab Illinois reached out to The Illini Democrats for their thoughts on the event but no reply has been received. The bake sale is set to happen on Tuesday, March 14, starting at 10am on the main quad. Protest events in response to the bake sale have also been arranged. 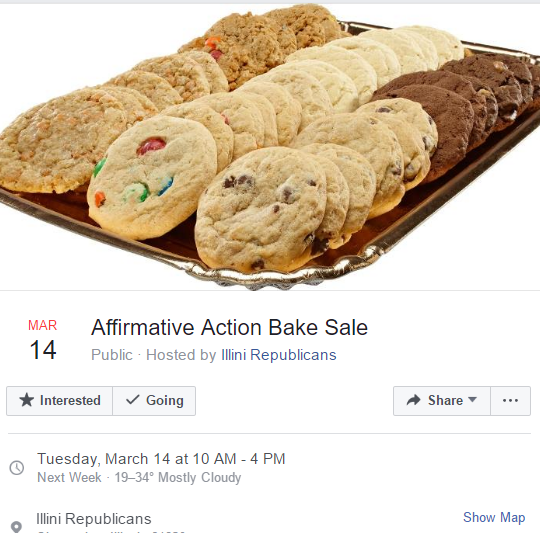 An event called ‘Blockade the Anti Affirmative Action Bake Sale’ hosted by current UIUC students Judah Ohitika and Earnest Lucious, plans to disrupt the Illini Republicans’ event. “We are attempting to prevent anyone from coming through to purchase cookies, socialize or even express support with the Illini Republicans who clearly hold a dominant and racist ideology,” it says. The Tab Illinois will be covering both events on Tuesday. Featured image taken at a similar bake sale held at UT Austin last semester.